Nick Cave & the Bad Seeds – Live at the Paradiso. Filmed by John Hillcoat, the Paradiso concert video is actually an edited compilation of footage shot at during a two-night gig, June 2nd and 3rd, during the Henry’s Dream World Tour, 1992. The editing style is kinetic and exciting, even though many fans dislike the piecing together of two separate shows. Nick Cave gives an electric performance, deftly captured by friend Hillcoat. Indeed, ‘Paradiso’ is a brilliant performance video that documents the magnificent magic conjured by a group of musicians many fans consider to be the best Nick Cave & the Bad Seeds line-up. Henry’s Dream was Martyn P. Casey’s first tour with the Seeds; his solid bass rhythms mesh perfectly with Tommy Wydler’s drumming. Conway Savage (keyboards/backing vocals), who joined the band in 1990, is in top form here, beautifully weaving his piano melodies into the tapestry of Mick Harvey’s guitar playing. Blixa Bargeld is also superb, his inimitable guitar exerting a satisfying tension between vocals, melody, and the restless, pounding beat. “The Weeping Song”, which follows, was originally written as a solo for The Good Son album (1990) but Nick changed it to a duet with Blixa Bargeld. The two men perform the song as a call and response between a father (Blixa) and his son (Nick). The Paradiso version is among the finest of live Weeping Song renditions. 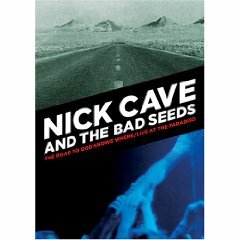 Nick Cave: Vocals; Blixa Bargeld: Guitar; Mick Harvey: Guitar; Conway Savage: Piano; Martyn Casey: Bass; Thomas Wydler: Drums. This entry was posted in 1990s Era, Nick & Blixa and tagged Nick Cave & The Bad Seeds, Paradiso, videos by Morgan Wolfe. Bookmark the permalink. Thank you, Deb and Caroline, for the information on Murder Ballads, and to Marianne for the valuable link. Good collaborative ‘Fix’! I’m sorry I couldn’t get back to respond to the comments. thank you everybody for your help; you are all very kind! has anyone there ever watched this: GREAT AUSTRALIAN ALBUMS 2 – MURDER BALLADS ?? i f***ing miss blixa in the band!! Yes, it’s a documentary about the album Murder Ballads, it was made in 2008. It contains excerpts from music videos, from the documentary about the Big Day Out festival in 1996 and interviews of The Bad Seeds and other related artists (Rowland S. Howard, Kylie Minogue…). It’s available on dvd. Thank you! ;D That’s from Nick’s private collection, isnt’ it? It’s one of the pics that made me faint! Bruises all up and my body because of this business. available in australia rodrigopp. about $30 AUS plus postage. I think I saw a torrent of that the other day. You might want to check if you can find it at http://www.isohunt.com. Aw! In Papa Won’t Leave You Henry you can see Blixa smile when Nick puts his head on his shoulder! So adorable. These are such Nixa videos. and I had always wondered why in these videos Nick is once wearing a shirt and then a suit. Sort of odd to put the two nights together. Fabulous anyway! It gives you the chance to compare both nights. This is my favourite Bad Seeds concert and my favourite line-up of the band. Nick is a non-stop whirling ball of sexual energy, and the chemistry between the whole band is amazing. I find this concert very red but you get used to it after a while. I return to watching this over and over again.